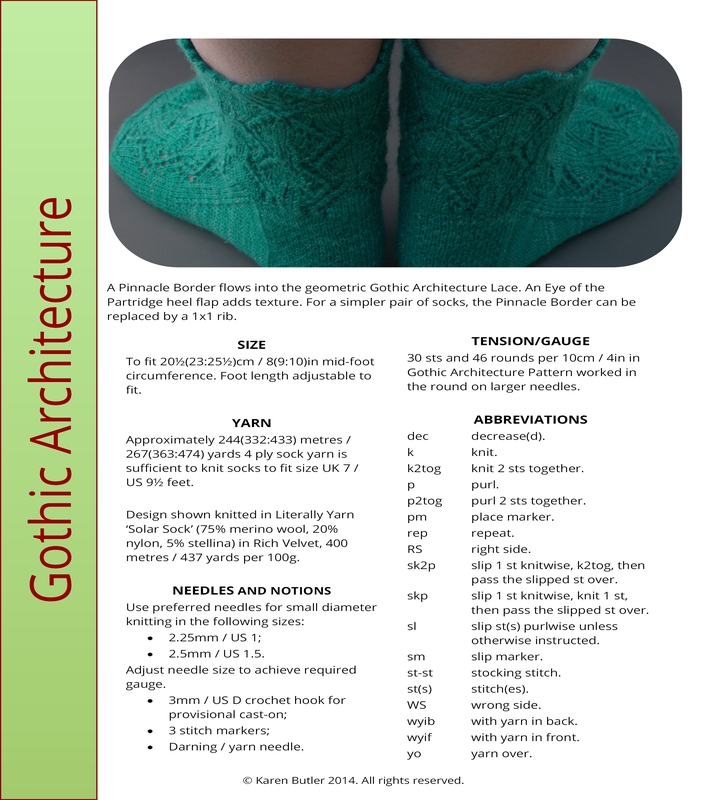 This beautiful Gothic Architecture sock pattern has been created by Karen Butler Designs (who also produces Literally Yarn) and is available as an online download (VAT inclusive). The Gothic Architecture Sock pattern was inspired by the pinnacles and other design features of late medieval buildings. The sock pattern includes instructions for a no-sew Picot edge and Pinnacle Border which flows into the geometric Gothic Architecture Lace. An Eye of the Partridge heel flap adds texture. For a simpler pair of socks, written instructions are included to replace the Pinnacle Border with a 1x1 rib. The Pinnacled Border and Gothic Architecture Lace patterns are charted. Each sock size has an individual chart page, complete with size specific notes and key. Written construction details include the Eye of the Partridge pattern. The pattern is downloadable in pdf format and can be viewed using Adobe pdf reader. A copy of this software is available at http://get.adobe.com/uk/reader/. Images have been provided by Karen Butler Designs. If you are a member of Ravelry and would like this pattern to appear in your Ravelry Library, please let us know your Ravelry username when you place an order. Sized to fit 20½(23:25½)cm / 8(9:10) inch ankle/mid-foot circumference. Foot length is adjustable to fit. Tension 30 stitches and 46 rounds in the Gothic Architecture pattern for 10cm/4 inch square. 3 stitch markers or small safety pin; darning / yarn needle and 3mm crochet hook for provisional cast-on . Design shown in Literally Yarn 'Solar Sock' (75% merino wool, 20% nylon, 5% stellina) in Rich Velvet, 400 metres / 437 yards per 100g. The yarn used is hand-dyed Literally Yarn, which is only available in small quantities in any colour. Literally Yarn 'Stellar Sock' and 'Nebula' Sock are alternatives.